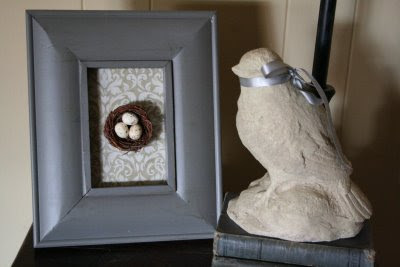 Perhaps some of you have seen this sweet little framed Nest from Melissa at 320 Sycamore. She was inspired by this sweet little Nest from the Nester herself! I had a shadow box frame lying around just begging to be used, so I found some scrapbook paper that lends itself well to the color scheme in my master, and then just hot glued the sweet little nest and eggs right on! Project total: less than $3! Edited to add: I have had a lot of people asking, so ....I purchased both the little eggs and the nest at Michael's Craft. Now go get your nest on!!! How lovely is that ??? I think all of the framed nests....yours, Melissa's and the Nesters' turned out beautifully! I have plenty of frames I could add something to, thanks for the idea! Come over and see my easy custom shower curtain idea, I'd love to inspire you! Every time I see one of these framed nests I can't help thinking how adorable they are. But, I'm wondering where y'all find the cute little nests to frame in the first place. I've never seen them around here. OH my goodness..that is just too cute! Just may have to do that. Hi Pam...I just found my little nest AND eggs at Michael's. So cute! I was gonna ask the same thing about the nest. I just did a cheap art project too on my blog. I may just have to try this too. Love the little nest! That is so cute. I am redoing my Living Room in bird houses, and that would go perfect. Thanks for the idea. So cute! Now that 3 of my favorite bloggers have made these, I think it's about time I gave it a try. How cute! I used that same scrapbook paper in frames in my master. Very cute idea! I have been on a roll lately with original wall art, so maybe I could whip one of these babies up too! Very cute!!! I may have to "borrow" this idea myself! I love how you achieve your projects!!!! So cute!!! now I really must get into high gear... thanks for the inspiration to get my nest on!! Nothing wrong with borrowing ideas, isn't this why we blog in the first place? :) Your turned out amazing as all your projects do. those wee little nests are delightfully charming! Imitation is the most sincere form of flattery, and that is soooo worth copying! It looks great! Hmmmmm I did not see those little nests and eggs at my local Michaels but I will check again as I have a little frame just dying for something cute like that!